Each Magnetic Base is held in place by powerful Neodymium Magnets. The Magnetic Base’s patented reactive spring system ensures the post will return to its original position impact after impact, reducing replacement costs. The base also has a 360° swivel and can be removed from the ADA-compliant base with our exclusive Removal Tool in 10 seconds. 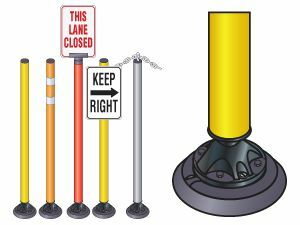 Our Gorilla Post delineators have a mounting base with six Rare Earth Neodymium Magnets with a pulling power of 380 psi vertical lift. The base also has a 360 swivel that springs back into an upright position even after a 15 m.p.h. impact. 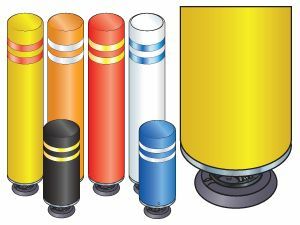 This 4 inch diameter magnetic bollard temporarily folds over upon impact, the bollard’s patented reactive spring system ensures the post will return to its original position impact after impact, reducing replacement costs. 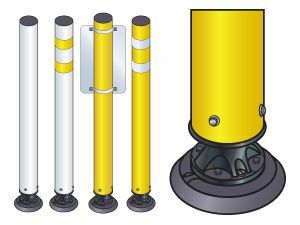 Excellent delineation with more visibility than standard delineator.